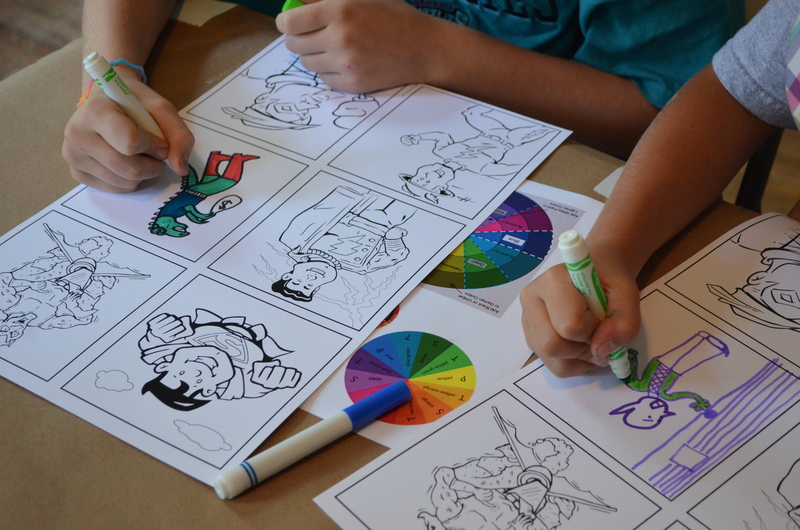 “Eh- what’s up, DAC?” – Teaching Kids To Draw Funny! Hey gang- Mr. MonkeyBoy here! 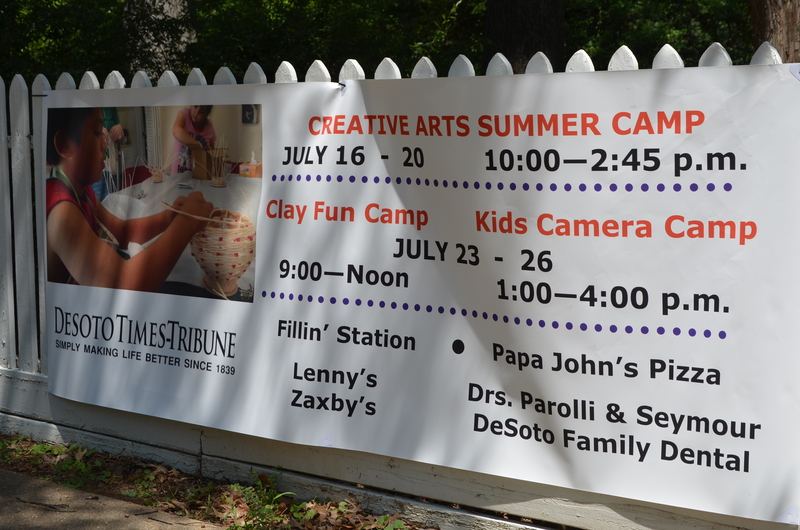 Last Friday I was one of the instructors at the DeSoto Arts Council’s Creative Arts Summer Camp in Hernando, MS. 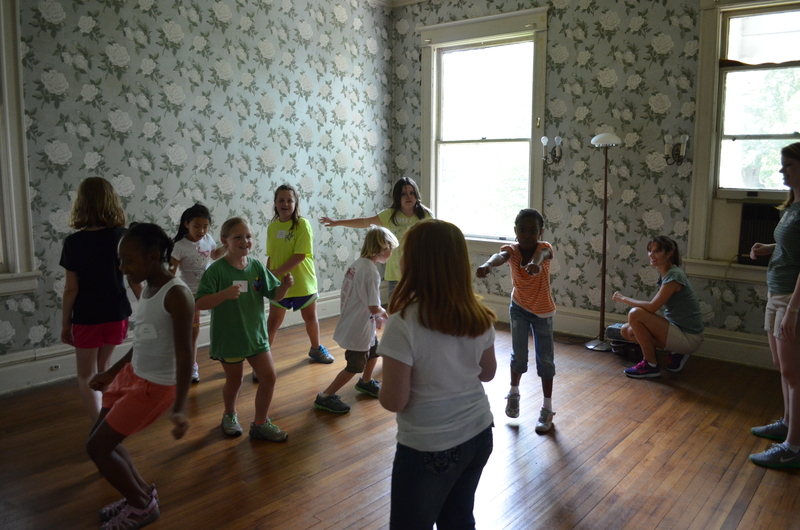 There were a little over 40 kids at camp, and were grouped into four classes. Each art class lasted about an hour and we taught two classes before lunch and two after. I got the younger kids first, and then older ones in the afternoon. My classes were on basic cartooning. I started off talking about colors and shapes and how they relate to basic character design. I was proud when after asking for several types of shapes- circles, squares, triangle, etc. I had some kids throw out sphere, cylinder, cone, trapezoid, and several others that I don’t remember from high school! After I drew them on a pad I asked the question, “What can we draw using these shapes?” A young girl in one of my first classes answered with, “ANYTHING!” That made my day, and we spent a few minutes turning shapes into things. 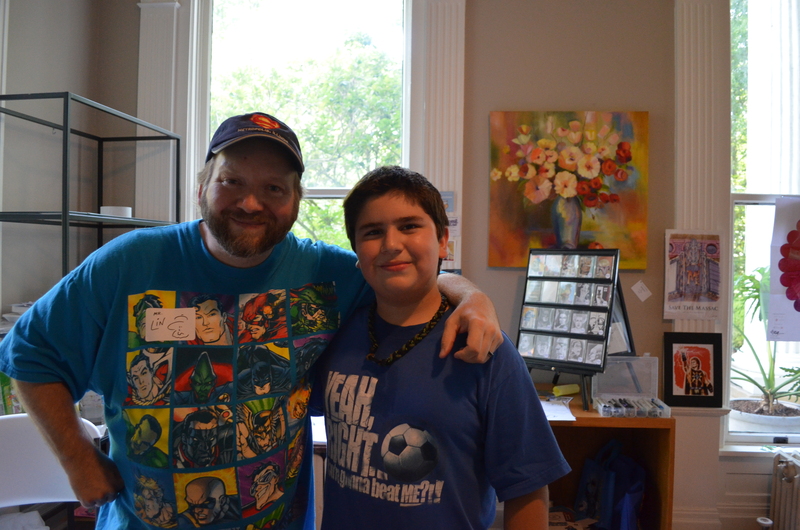 I showed them some of my work and the Bushi Tales characters I helped design, then we drew superheros, villains, and a slew of animated characters and objects. 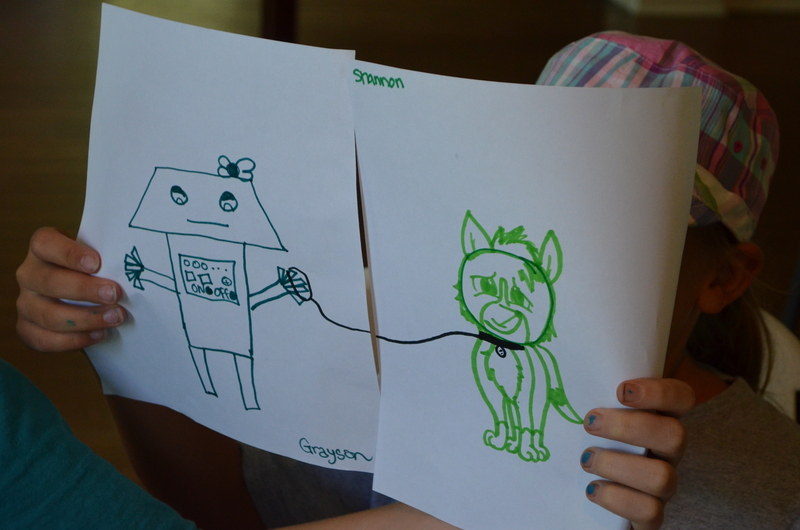 Kids also drew their own characters, which was fun to watch. 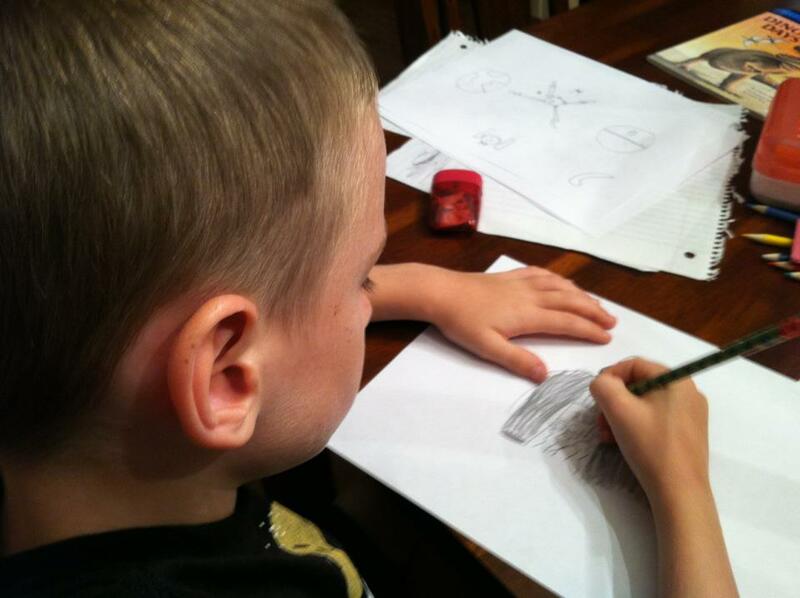 With the last class of older kids I also talked a bit about depth of field, foreshortening, and perspective, too. I showed them some of the markers and pens I use, and how color and line weight can help with depth of field. Didn’t want to go over their heads and only had an hour to give them the basics I know, but I think they got a lot out of it. I know they all had fun! 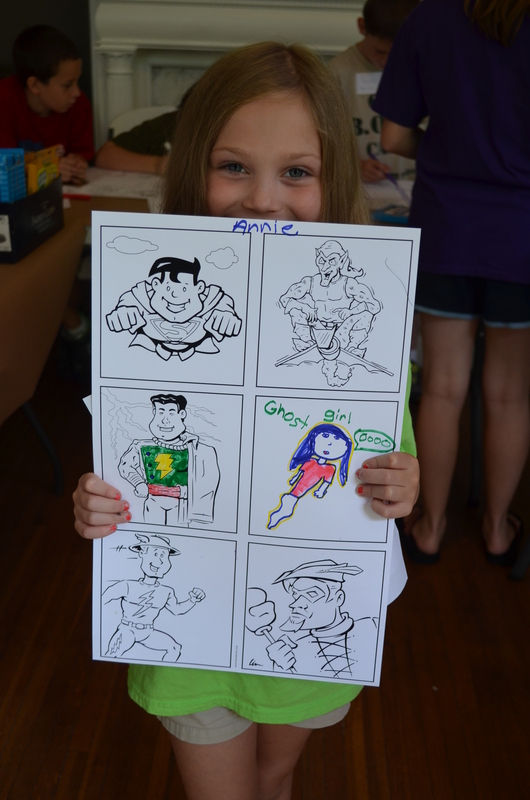 We had some posters made up for them to color, and left a space for them in the middle to draw their favorite character, or create their own character. I had a couple of the girls ask me where the girl heroes were- which is what my wife Nicki and DAC director Vicky Neyman asked me, too. Oops..! I told them, “You get to draw your favorite girl character on the poster- or you can make up your own.”- which is what some did! I had a few “How To” cartooning books with me and a couple had Batgirl and Wonder Woman which some of the kids used for reference. 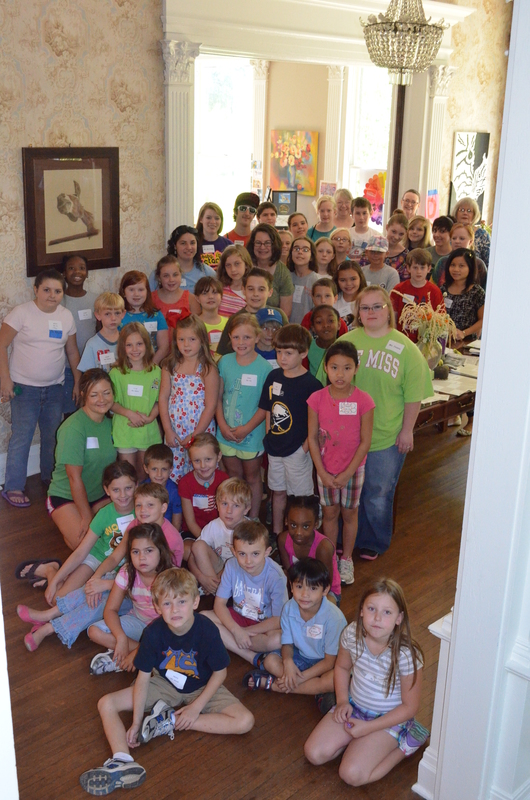 It was great seeing all the kids excited about drawing. 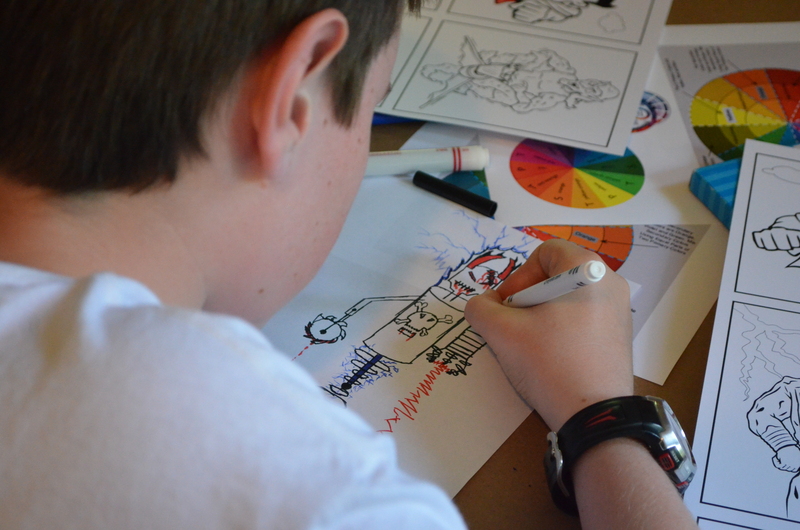 Even the ones that seemed like they’d rather be somewhere else at the beginning of class were throwing out shape and character suggestions and drawing or coloring before their class ended. I even had some tell me they had been waiting all week for my class, and a few brought sketchbooks or their Nintendo DS to show me some of their work. 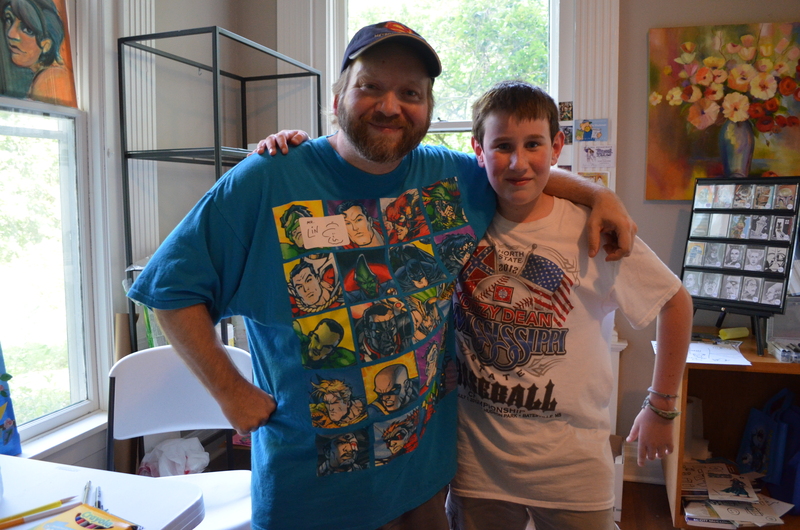 One of them was my new buddy Kevin who loves drawing anime and likes superheroes. After my last class he brought me his sketchbook and asked me to draw in it. He left it up to me so I drew a Martian from Mars Attacks in it. He and his friend Victor got a kick out of it and I ended up doing a Phantom of the Opera sketchcard for Victor. Victor is from France and was visiting family in the states over the summer. He’s only been in the country for about a month, but speaks better English than most folks who were born here! He and Kevin were great students, and I wish I had gotten a shot of this cartoon when Victor finished it. 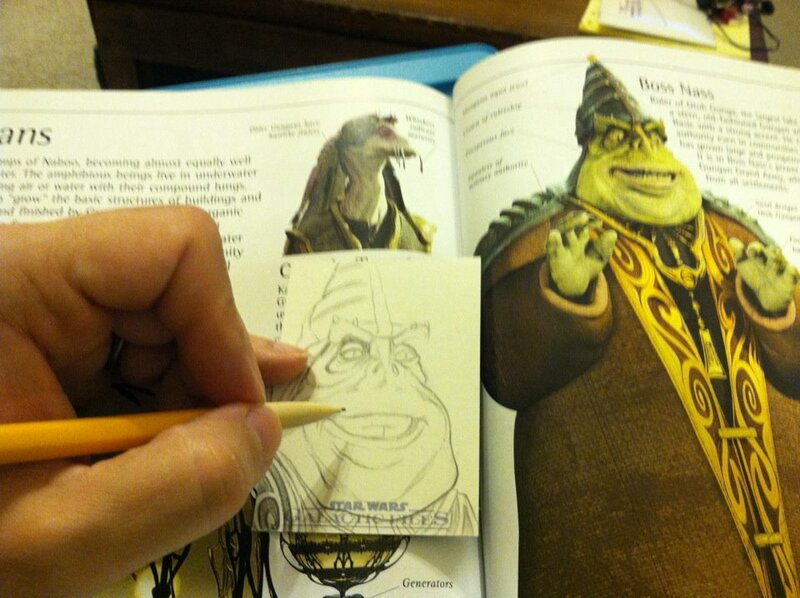 He had asked for a fine tip pen to finish his drawing. Down the side of the “death robot” he wrote “MADE IN CHINA”. That cracked me up! 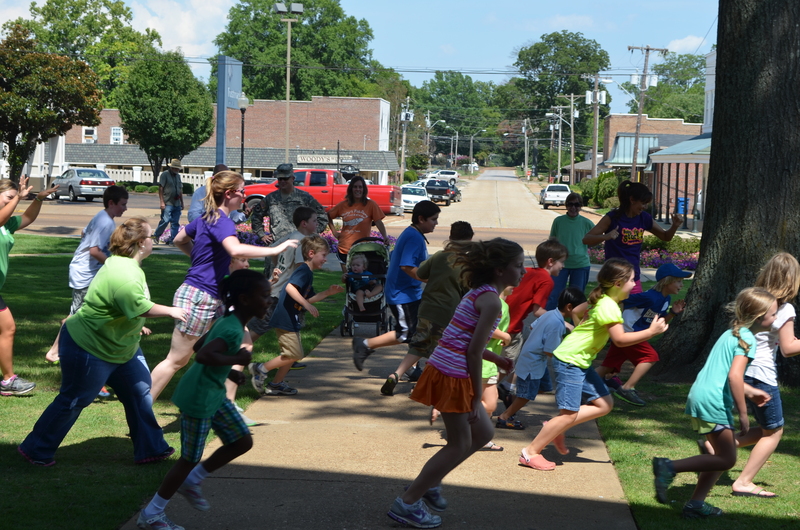 At the end of the day we all headed up to town square and the kids performed a flash mob number in front of the courthouse. The mayor was even there to watch. The kids had been practicing all week to perform in front of their families. They practiced indoors and outside- when it wasn’t too hot. 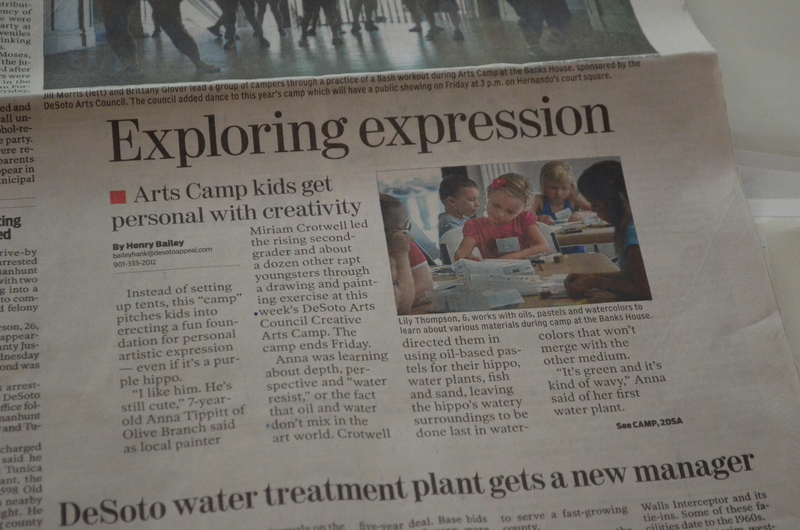 There was also lots of other things to keep the kids entertained- basket weaving, painting, printmaking, and more. 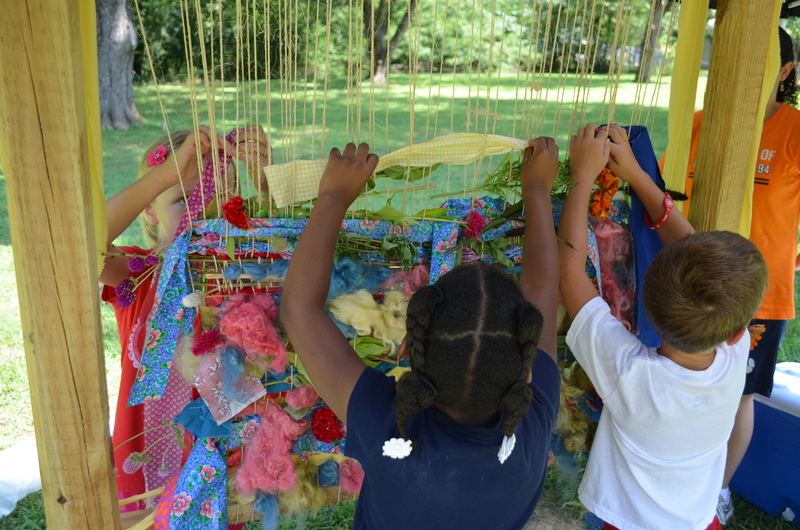 One the kids really liked on Thursday was weaving outdoors on a big loom with ribbons and some flowers they picked from the DAC gardens. 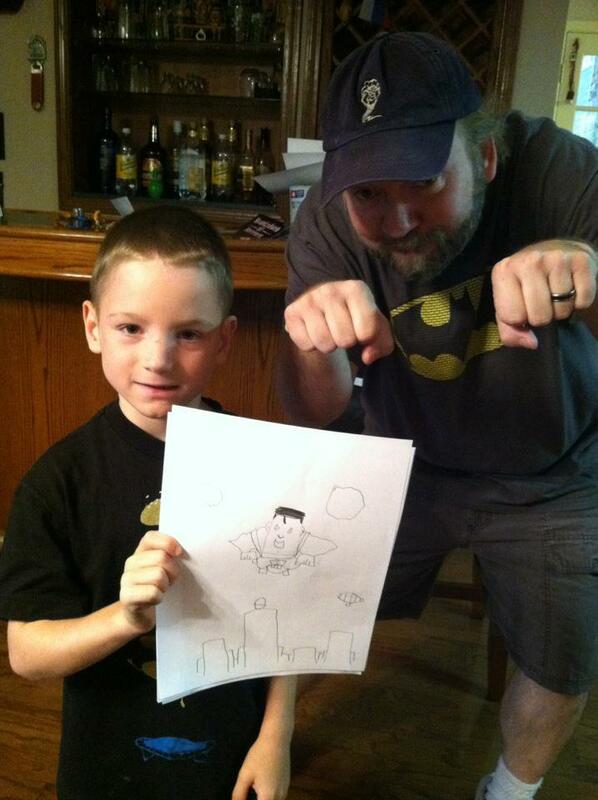 Oh, in other drawing news- the week before I had a “Super” time drawing cartoons with my lil’ buddy Owen French. 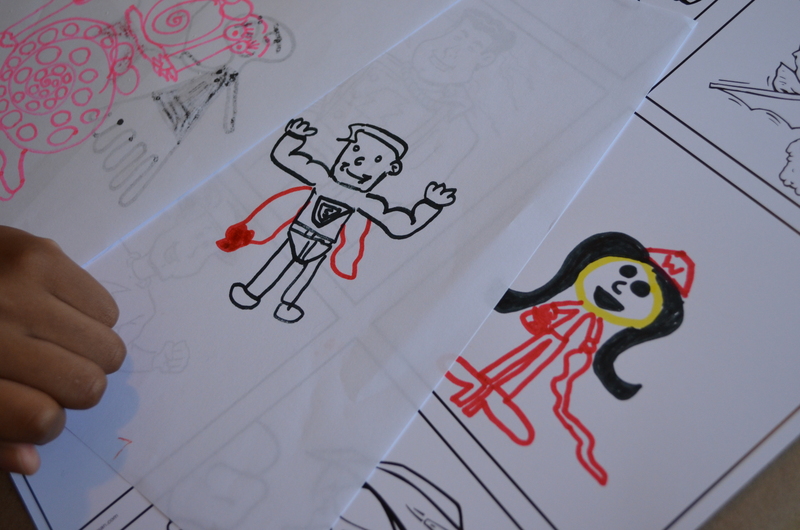 We spent a couple hours on a Friday morning drawing Superman, Batman, Darth Vader, Sponge Bob, Two-Face, spaceships, and more. 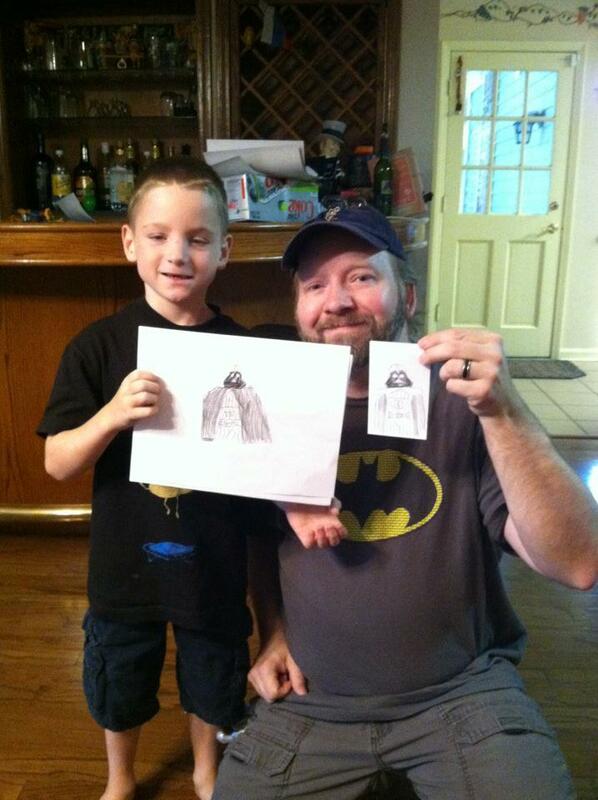 Hope to draw with Owen again soon, and can’t wait to have him help me paint the haunted house! I’ll have another Star Wars sketchcard update this week, and will be posting another Metropolis Superman Celebration update on my Have Geek Will Travel site, too. 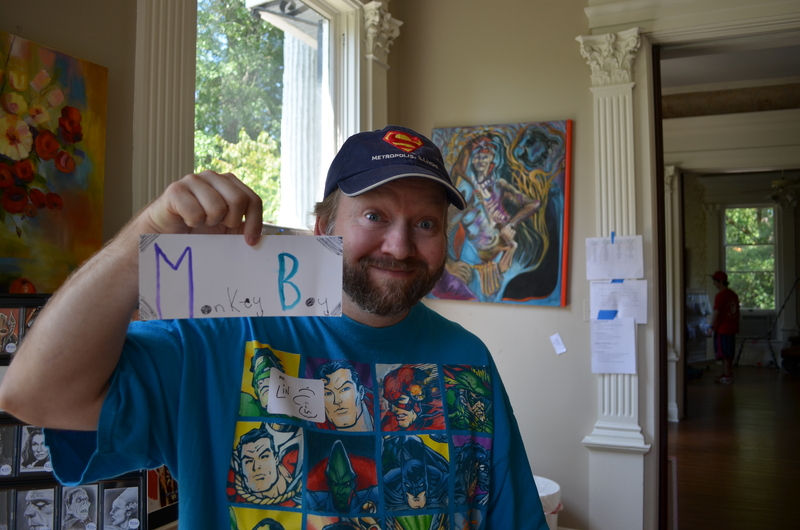 Until then, stay super and keep drawing funny!